Imagine taking a bite of your favorite food. Is it sweet? Salty? Does it have a sour bite or a hint of bitterness? Maybe even a touch of savory umami? Every time we eat, our taste buds sample these five basic taste qualities. Taste receptors decorating the surface of each taste bud interact with specific molecules; the corresponding flavor sensation then gets sent to your brain. 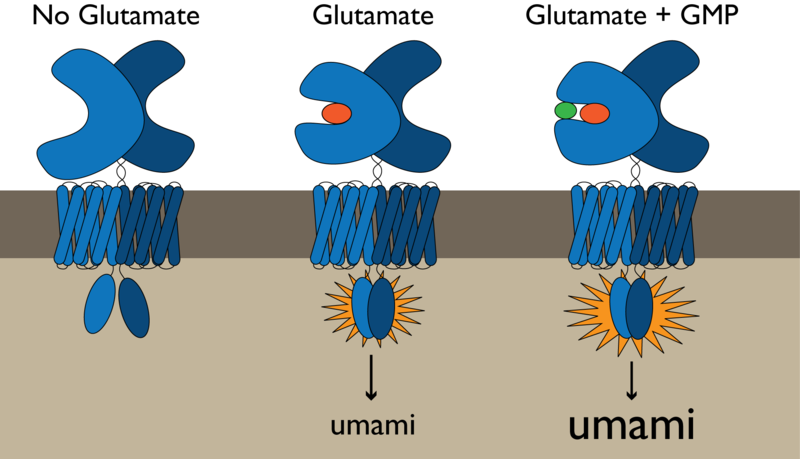 Umami receptors, for example, sense the molecule glutamate. When free glutamate in our food—either naturally occurring or from added MSG—interacts with an umami receptor, we taste a delicious savory flavor. Although glutamate is the primary source of umami flavor, certain molecules called nucleotides can enhance the umami sensation. Because nucleotides make up the genetic material (DNA and RNA) of all living things, nucleotides are ubiquitous in many of the foods we eat. Nucleotides themselves cannot activate umami taste receptors, but they can intensify the umami sensation caused by glutamate. Intrigued by this phenomenon, scientists Ole Mouritsen and Himanshu Khandelia recently published a paper exploring how one nucleotide, guanosine-5ʹ-monophosphate (GMP), might work together with glutamate to activate umami taste receptors. Only one of the three known umami taste receptors can interact with both glutamate and GMP. This so-called “T1R1/T1R3” receptor switches between two states: an “off” state when no glutamate is present and an “on” state when glutamate is attached to the receptor. To understand how GMP might affect these two states, Mouritsen and Khandelia ran a series of computer simulations testing the receptor’s behavior in the presence or absence of GMP. As expected, glutamate caused the receptor to exist in the “on” state more than the “off” state. When GMP was added to the simulation, both GMP and glutamate interacted with the receptor to further stabilize the “on” state. Model of the T1R1/T1R3 umami taste receptor. The taste receptor (in blue) is “off” when no glutamate is present. Glutamate interacts with the receptor, stabilizing the “on” state and signaling an umami taste sensation. Glutamate and GMP together bind the receptor and further stabilize the “on” state, presumably leading to a longer, more intense umami sensation. Besides providing a compelling molecular model for umami taste sensation, this and future work on taste receptors may help us become more savvy seasoners in the kitchen. Because umami taste receptors are similar to the taste receptors for sweet and bitter, understanding how molecules like GMP enhance umami sensations can help us develop enhancers for other taste sensations. Just as GMP makes glutamate taste more intensely umami, a sweet enhancer could make sugar taste sweeter with no added calories. Identifying more taste enhancing molecules like GMP could bring a whole new dimension to the way we cook in the future. Forget about salt and pepper—the flavor enhancers are coming. Read the paper: Mouritsen OG, Khandelia H (2012) Molecular mechanism of the allosteric enhancement of the umami taste sensation. FEBS Journal 279: 3112–3120. Tags: glutamate, GMP, MSG, nucleotide, research, taste, taste receptor, umami. Bookmark the permalink.